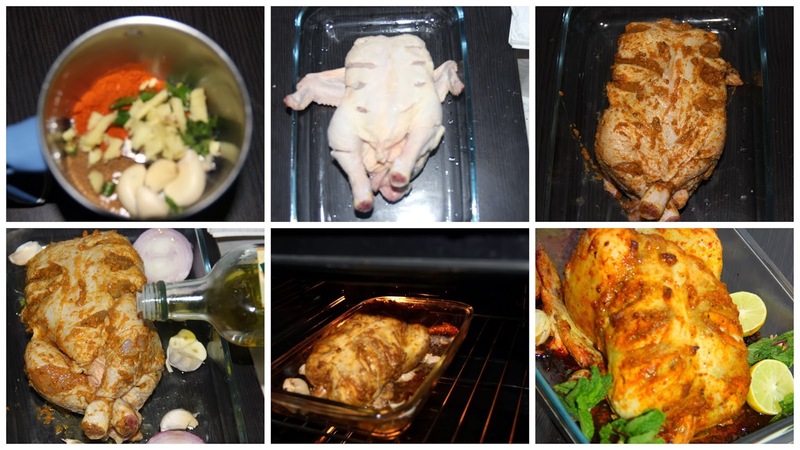 Roast chicken can be prepared very easily on lazy days. Perfect for the Christmas party. In Original Roast chicken they did not score the skin and apply any spices or masalas. Roast chicken is very bland in taste for the Indian palatte. So I gave a twist to this recipe with Indian masalas and spices and this came out really well. Actual Roast Chicken is prepared in a similar way but chicken is not scored. Herbs like thyme or rosemary are added for flavor, seasoned with lime juice, salt and roasted. I have given an Indian twist to this recipe by scoring and applying masala paste. 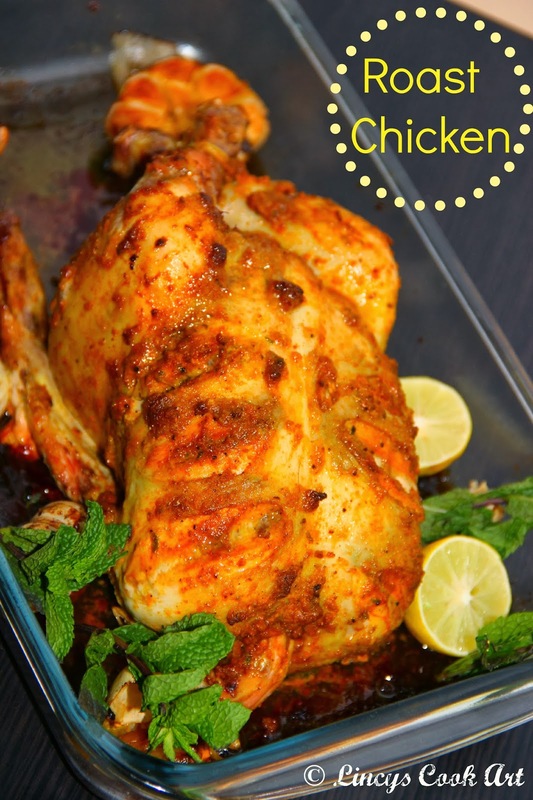 You can say this chicken as Indian version of Roast chicken. Spicy flavorful chicken. Place half lemon in the cavity of the chicken and tie the legs with kitchen strings or a rubber band to secure. Grind all ingredients mentioned to grind as a fine paste. Score the chicken using a sharp knife so that the masalas penetrates the chicken. Apply the masala paste all over the chicken and keep for 30 minutes aside. Place the garlic, onion in a baking dish and top with the chicken. Drizzle with olive oil and sprinkle lime juice over chicken, onion and garlic. Twist and fold the chicken wings to back, otherwise it may burn. Preheat oven to 200°C. Roast for 1 hour. Then take the tray and brush the chicken with butter. Decrease the temperature to 180°C and roast for a further 5-15 minutes or until the skin is golden and the juices run clear when tested with a skewer. Note: I have added Onion and Garlic on the tray with the chicken. You can use any veggies roughly chopped like carrots, potatoes, sweet potatoes…etc before roasting. If you use chicken heavier than this increase the cooking time. Increase 10 minutes extra for each 100 gram of chicken. Likewise for smaller chicken reduce the cooking time 10 minutes for each 100 gram. The pan juices can be deglazed and used as to make gravy. Chicken looks so yummy and tempting...perfect party dish.